SPW019464 SCOTLAND (1927). Glasgow, general view, showing Central and Queen Street Stations. An oblique aerial photograph taken facing north-east. Title [SPW019464] Glasgow, general view, showing Central and Queen Street Stations. An oblique aerial photograph taken facing north-east. 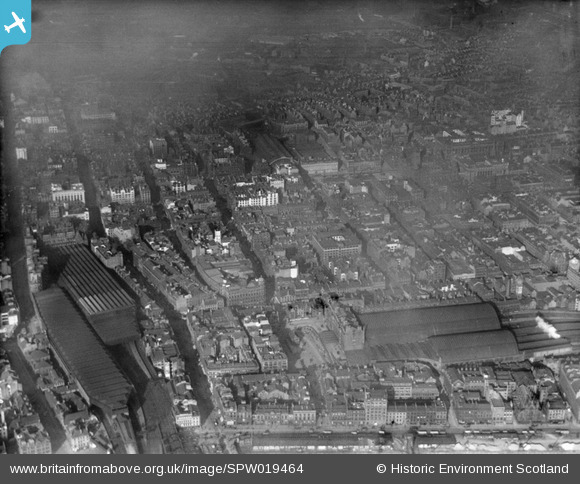 and St Enoch Station at lower right. St Enoch's Station at the right, now replaced by St Enoch's Centre. Queen St upper middle.